The Fall of Carthage is Adrian Goldsworthy’s account of the three wars between Rome and Carthage, the two great Mediterranean city states, from their first clashes in 265 BCE to the final destruction of Carthage in 146 BCE. It’s a clear and compelling account, but I must say I found it less gripping that Goldsworthy’s biography of Caesar. On reflection this is not because of any lack of scholarship on the part of Goldsworthy or any less elegance in his writing. It is rather a problem of the sources which are sparser in comparison with Caesar’s era and significantly less colourful: Hannibal, for example, has left no correspondence from which to gain insight to his tactical and strategic thinking, let alone his life and loves. However there remain, I think, some inescapably timeless lessons from the narrative. In the first Punic war, which was primarily a naval contest, the Carthaginians had by far the superior navy. Naval fighting in those days focused on ships trying to ram each other and this required considerable skill amongst the ships’ crews which the Romans found they simply could not match. So instead they conceived of a tactic of grappling and boarding the Carthaginian vessels and soon rendered the skill of ships “dog-fighting” each other substantially obsolete. The second Punic war opened with Hannibal’s extraordinary invasion of Italy from across the Alps. This was followed rapidly by his stunning successes at Lake Trasimene and Cannae, which subsequent historians have argued left the path to Rome open to him. Goldsworthy argues that Hannibal did not follow this path because by all contemporary measures he had won the war and expected a settlement. The Romans however had, unappreciated by most of their contemporaries, conceived war totally differently and indeed waged it totally as a consequence. Hence they were prepared to absorb eye watering levels of casualties sooner than admit defeat. 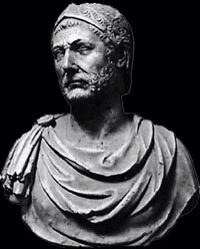 As a result it was the tactically undefeated Hannibal who was driven out of Italy by a strategy which, certainly at the outset of his war, he could never have conceived of. Both these examples show how a wholly new reconceptualisation of a situation can lead to previous ideals being rendered irrelevant. Reflection on these wars also corroborates Thucydides assertion that wars tend to be fought for three principle reasons: “honour” – meaning here not integrity but rather that peculiar sense of reputation or personal worth that used to bring young men onto duelling grounds to kill each other, and still is used by some men to justify their murder of female relatives – “fear” and “profit’. In spite of much human progress since Scipio Aemilianus oversaw the final genocide at Carthage, humanity still does not seem to have found a cure for these ills. This entry was posted in Book Review, History by aidanjmcquade. Bookmark the permalink.